When I worked with sporting teams, we had a saying about players that had an exceptional work ethic. We called it 'Athlete Mentality'. In the circle of coaches that I worked with, it was a known remark, and although not clearly defined, when someone said "This kid's got an athlete mentality," the meaning was universally acknowledged. The other day I tried to explain it to a client, and it drew a blank expression. So here, I'm going to give you a sense of what it is and how you can apply it in the workplace. The average athlete has 4500 training sessions over a 10 year career. Simply put, if they don't maximise each one of those training sessions, they won't even nearly fulfill their potential over the long term. If they waste 20% of the sessions, they won't be as good. So those with athlete mentality learn how to maximise every opportunity to improve. In the workplace, I see the most productive people with the same approach. If you find yourself with 30mins spare at the end of the day, don't waste it doing low-impact meaningless things to pass the time. Instead, pick one or two things that make a big impact, even if they take a lot more effort. Successful athletes are prepared for every day's opportunity. While some turn up to practice three minutes before the start of training, the great ones are there early and they're ready to get the job done. While some have eaten a cheeseburger on the way to the field, others have fuelled themselves optimally to maximise their performance. Great performers get themselves in the best state to hit the ground running when it's time to perform in training or on game day. These people don't waste 30 minutes at the start of a session 'getting into it'. They are ready to go. Wasting 30mins per training session over 4500 sessions means a lot of wasted time. In the workplace, it's the small things that make a difference to your preparation and execution. Plan your days and weeks so you don't waste time, fuel yourself properly, get the right amount and kind of sleep, and don't let negative events and emotions gobble up precious time and resources - learn to be resilient. When great athletes practice, they do it at game day intensity. Sure, there are times when they have to accumulate running miles or skill practice, but the majority of what they do is high quality work. And when the quality starts to drop off, they don't continue to practice unhelpful behaviours. In the workplace, most people get caught up with the amount of time people spend at their desks, as opposed to how productive that person actually is. I know plenty of people that can get the same work done in six hours that other people would do in nine. Being productive is about short bursts of high intensity, quality work - not spending hours getting sidetracked and switching tasks, with only minimal high-quality work being completed. 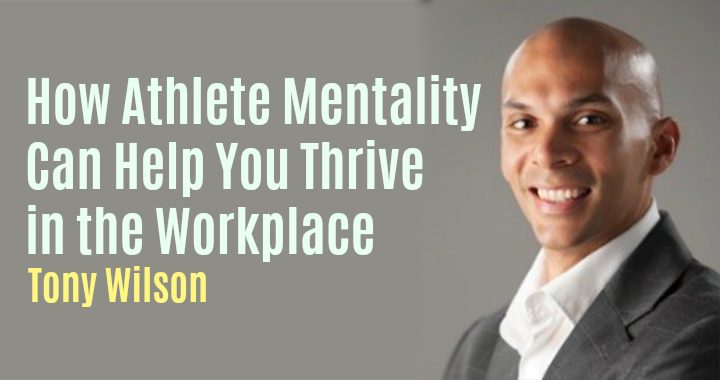 If you can apply athlete mentality in the workplace, your ability to do more, higher quality work dramatically improves. And if you don't care that much about work, it frees up your time to spend on the things that are most important. If you would like to know more about Tony Wilson, click here to submit your enquiry or contact us directly on 1300 55 64 69.